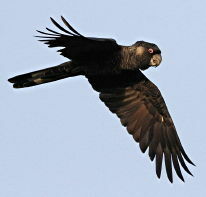 Torbay Catchment Group is currently undertaking conservation efforts to manage threats, and improve habitat for the three species of black cockatoo. Collect data and report on cockatoo activity and numbers within the greater Torbay catchment. The Western Australian Museum has produced activity sheets that are great for younger children to colour in as well as for older children who can research the correct colours required for the birds and surrounding vegetation. You can download (and then print) these drawings of Baudin’s, Carnaby’s, Carnaby’s at a nesting box, Forest Red-tailed and all three, and teachers can access additional material from the Museum’s cockatoo-care resources page. Photos on this page are used with the kind permission of Keith Lightbody. Go to Keith’s website to see more black cockatoo pictures, as well as photos of other Western Australian birds. Have you seen black cockatoos recently? 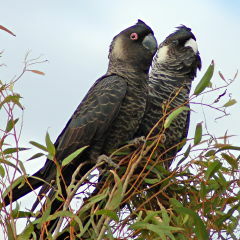 Carnaby’s Cockatoo (formally known as the Short-billed Black Cockatoo) is found across the greater Torbay catchment and is regularly seen in pairs or small flocks. Due to the wetter environment and array of suitable vegetation (food species) it is relatively common across the catchment. This being said, in recent decades the number of birds has declined due to habitat loss especially in its main breeding grounds in the wheatbelt. It is classed as endangered under the Federal Environmental Protection and Biodiversity Conservation Act. Description: Carnaby’s cockatoo is a brownish black colour with off white tips on its feathers which give it a scaly appearance. They have a short broad beak (shorter than Baudin’s) with an off white patch of feathers on the ear-coverts (male) and large white tail feathers. The males (bird on the left in the photo) differ from females in that they have dusky white ear coverts and females have yellowish white ear coverts. The bill of the male is black and they have bare pink skin around the eye, whereas the female has a grey or greyish white bill with a black tip and bare grey skin around the eye. Range: Carnaby’s Cockatoo is endemic to, and widespread in, the southwest of Western Australia. It occurs mostly in the wheatbelt, in areas that receive between 300 and 750 mm of rainfall annually, but is also found in wetter regions in the extreme southwest (including the Swan Coastal Plain and the southern coast). Its range extends from Cape Arid to Kalbarri, and inland to Hatter Hill, Gibb Rock, Narembeen, Noongar, Wongan Hills, Nugadong, near Perenjori, Wilroy and Nabawa. Most records are from south of 29°S. and west of 120°E. They breed between July and December (mainly in the wheatbelt), using hollows of old smooth-barked eucalypt trees such as Salmon Gum and Wandoo. They live for 25 to 50 years. Within the greater Torbay catchment, Carnaby’s Cockatoo can be found feeding on seeds of Banksia, Dryandra, Grevillea and eucalypt species such as Marri. They also are regularly found feeding in pine trees. Crop species like canola and nut trees like almonds and macadamias are also food sources. The decline of the species has been caused mainly through the loss of habitat through land clearing. The amount of nesting hollows has also reduced with the cockatoos now having to compete with Galahs, Corellas and the feral European honey bees. Other threats include fire and vehicle strikes. Baudin’s Cockatoo (formally known as the Long-billed Black Cockatoo) is also found across the greater Torbay catchment in pairs and small flocks. Like the Carnaby’s Cockatoo they are relatively common in the catchment but have reduced in number due to habitat loss and reduced availability of nesting hollows. They are also listed as endangered under the Federal Environmental Protection and Biodiversity Conservation Act. Description: Baudin’s Cockatoo has a similar appearance to Carnaby’s Cockatoo with a brownish black colour and have off white tips on its feathers which give it a scaly appearance. The main visual difference to the Carnaby’s Cockatoo is their bill which is longer in the upper bill and extends well past the tip of the lower mandible, whereas the Carnaby’s barely extends past the lower mandible. The males (illustrated) have a black bill with an off white patch of feathers on the ear-coverts and bare pink skin around the eye. The female differs from the male in having a greyish bill with a dark tip, bright yellowish white ear covets and bare grey skin around the eye. Range: Baudin’s Cockatoo is found only in the extreme southwest of Western Australia. The range of the species, which is generally bounded by the 750 mm isohyet, extends from Albany northward to Gidgegannup and Mundaring (east of Perth), and inland to the Stirling Ranges and near Boyup Brook. Breeding has been recorded in the far south of the range, in an area extending from Nornalup northward to near Bridgetown, or sometimes further north to Lowden and Harvey. They breed between August and December using hollows of Karri, Tuart, Marri, Wandoo and Bullich trees. They live for 25 to 50 years. Within the greater Torbay catchment they can be found feeding on seeds and flowers of Marri, Jarrah, Banksia and Hakea species, and they sometimes eat fruiting apples and pears. They also eat insect larvae from dead trees and will strip off bark to get a meal. They suffer the same threats as Carnaby’s Cockatoo through loss of habitat and availability of nesting hollows. Forest Red-tailed Black Cockatoos (also known as the Red-tailed Black Cockatoo) are found across the greater Torbay catchment and are regularly seen in pairs or small flocks. They are not as abundant as the two white tailed cockatoos and are more patchily distributed. They tend to be seen in tall trees whereas the Baudin’s and Carnaby’s Cockatoo are seen in coastal heath areas as well. Their numbers have reduced in recent decades due to habitat loss and availability of nesting hollows. They are classed as vulnerable under Federal Environmental Protection and Biodiversity Conservation Act. Description: The male and female have distinctive colouration so are easy to tell apart. 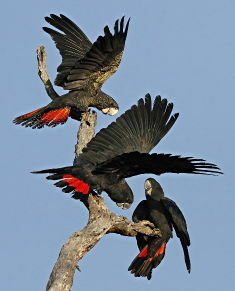 The male (two lower birds in photo at left) is a glossy black colour with broad red tail panels and has a dark grey blackish bill. The female (top bird at left) has a black glossy head and wing coverts spotted with pale yellow. The breast and belly are barred with orange yellow with the tail banded with orange yellow on the undertail coverts. The bill is a pale greyish white. The Forest Red-tailed Black Cockatoo also has a much taller crest than Carnaby’s or Baudin’s Cockatoo. Range: The species Calyptorhynchus banksii, which consists of four or five subspecies, has a patchy distribution throughout Australia. The Forest Red-tailed Black Cockatoo (subspecies naso) occurs only in the southwest from Gingin in the north, east to Mt Helena, Bannister and Kojonup and south to the King River east of Albany. Its range does not overlap the distribution of any of the other subspecies. They nest in chimney stack type hollows of Marri, Jarrah, Wandoo, Karri and Bullich between March and December. They live for 25 to 50years. Within the greater Torbay catchment they can be found feeding on Marri, Jarrah, Blackbutt, Karri, Sheoak and Snottygobble, as well as some ornamental eucalypts and introduced Cape Lilac. They suffer the same threats as Baudin’s and Carnaby’s Cockatoo through loss of habitat and availability of nesting hollows.